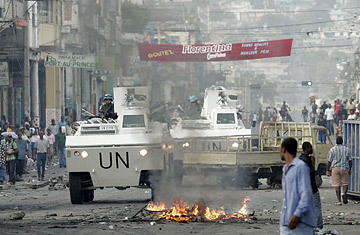 U.N. peacekeepers patrol in an armored vehicle during protests on a street in Port-au-Prince, Haiti. The idea of the starving masses driven by their desperation to take to the streets and overthrow the ancien regime has seemed impossibly quaint since capitalism triumphed so decisively in the Cold War. Since then, the spectacle of hunger sparking revolutionary violence has been the stuff of Broadway musicals rather than the real world of politics. And yet, the headlines of the past month suggest that skyrocketing food prices are threatening the stability of a growing number of governments around the world. Ironically, it may be the very success of capitalism in transforming regions previously restrained by various forms of socialism that has helped create the new crisis. Haiti is in flames as food riots have turned into a violent challenge to the vulnerable government; Egypt's authoritarian regime faces a mounting political threat over its inability to maintain a steady supply of heavily subsidized bread to its impoverished citizens; Cote D'Ivoire, Cameroon, Mozambique, Uzbekistan, Yemen and Indonesia are among the countries that have recently seen violent food riots or demonstrations. World Bank president Robert Zoellick noted last week that world food prices had risen 80% over the past three years, and warned that at least 33 countries face social unrest as a result. The sociology of the food riot is pretty straightforward: The usually impoverished majority of citizens may acquiesce to the rule of detested corrupt and repressive regimes when they are preoccupied with the daily struggle to feed their children and themselves, but when circumstances render it impossible to feed their hungry children, normally passive citizens can very quickly become militants with nothing to lose. That's especially true when the source of their hunger is not the absence of food supplies but their inability to afford to buy the available food supplies. And that's precisely what we're seeing in the current wave of global food-price inflation. As Josette Sheeran of the U.N. World Food Program put it last month, "We are seeing food on the shelves but people being unable to afford it." When all that stands between hungry people and a warehouse full of rice and beans is a couple of padlocks and a riot policeman (who may be the neighbor of those who're trying to get past him, and whose own family may be hungry too), the invisible barricade of private-property laws can be easily ignored. Doing whatever it takes to feed oneself and a hungry child, after all, is a primal human instinct. So, with prices of basic foods skyrocketing to the point that even the global aid agencies  whose function is to provide emergency food supplies to those in need  are unable, for financial reasons, to sustain their current commitments to the growing army of the hungry, brittle regimes around the world have plenty of reason for anxiety. The hunger has historically been an instigator of revolutions and civil wars, it is not a sufficient condition for such violence. For a mass outpouring of rage spurred by hunger to translate into a credible challenge to an established order requires an organized political leadership ready to harness that anger against the state. It may not be all that surprising, then, that Haiti has been one of the major flashpoints of the new wave of hunger-generated political crises; the outpouring of rage there has been channeled into preexisting furrows of political discontent. And that's why there may be greater reason for concern in Egypt, where the bread crisis comes on top of a mounting challenge to the regime's legitimacy by a range of opposition groups. The social theories of Karl Marx were long ago discarded as of little value, even to revolutionaries. But he did warn that capitalism had a tendency to generate its own crises. Indeed, the spread of capitalism, and its accelerated industrialization and wealth-creation, may have fomented the food-inflation crisis  by dramatically accelerating competition for scarce resources. The rapid industrialization of China and India over the past two decades  and the resultant growth of a new middle class fast approaching the size of America's  has driven demand for oil toward the limits of global supply capacity. That has pushed oil prices to levels five times what they were in the mid 1990s, which has also raised pressure on food prices by driving up agricultural costs and by prompting the substitution of biofuel crops for edible ones on scarce farmland. Moreover, those new middle class people are eating a lot better than their parents did  particularly more meat. Producing a single calorie of beef can, by some estimates, require eight or more calories of grain feed, and expanded meat consumption therefore has a multiplier effect on demand for grains. Throw in climate disasters such as the Australian drought and recent rice crop failures, and you have food inflation spiraling so fast that even the U.N. agency created to feed people in emergencies is warning that it lacks the funds to fulfill its mandate. The reason officials such as Zoellick are sounding the alarm may be that the food crisis, and its attendant political risks, are not likely to be resolved or contained by the laissez-faire operation of capitalism's market forces. Government intervention on behalf of the poor  so out of fashion during globalization's roaring '90s and the current decade  may be about to make a comeback.